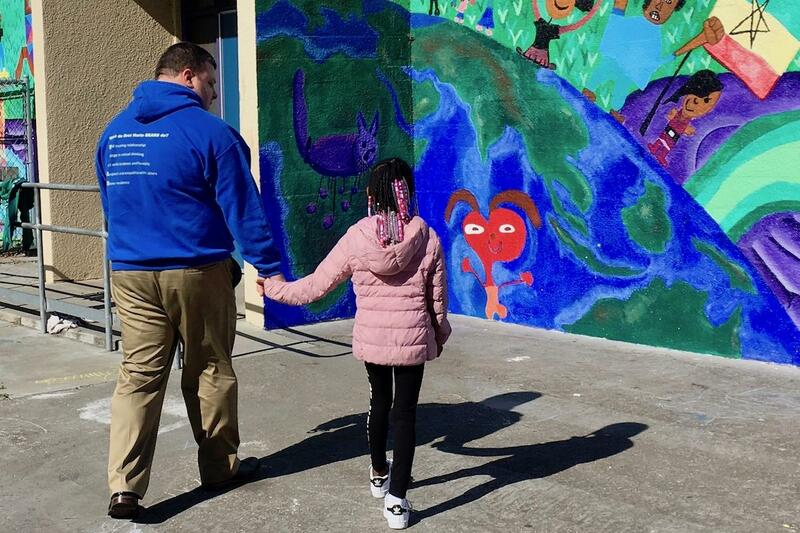 Bret Harte Elementary School Principal Jeremy Hilinski escorts a student back to class after spending a little one-on-one time with her. When the head of the San Francisco chapter of the NAACP demanded the city declare a “state of emergency” to tackle low academic test results for African American students, he turned the blame on the grown-ups. “It’s not that the children are failing,” the Rev. Amos Brown told school board trustees. “I’m using the plural pronoun ‘we.’ We are failing.” The so-called equity gap has persisted for decades: As a group, African-American students in San Francisco and across the country struggle in public school, often posting the lowest test scores and graduation rates, and the highest rates of suspension and chronic absenteeism. KALW Education Reporter Lee Romney set out to explore the systemic inequities that have hampered African American students in this changing city. Her ongoing series also showcases the resilience and power of black youth and their families, and the efforts of educators and community advocates to help them thrive. San Francisco Unified School District’s African American educators have been honoring the achievements of black students who earn a 3.0 grade point average or above for a quarter of a century. This year’s emcees say the event celebrates an often-ignored narrative of excellence.